New Year’s Eve fireworks over the Strip. Photo by Mark Damon of the Las Vegas News Bureau. How do you distinguish New Year’s Eve in Las Vegas from any other night? Not easily. We are a city for which New Year’s revelry is a daily occurrence in spirit if not fact, so in order to meet the expectations of 300,000 or so visitors hoping for an even greater adrenaline rush, we are obligated to up our game – if that’s possible. Well guess what? It is! 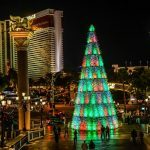 There is an abundance of New Year’s Eve festivities in Las Vegas, highlighted by an eight-minute fireworks display above the Strip at midnight. So if you’re staying with us over the holiday and looking for something to do on NYE, you won’t suffer for options. Just click here for all the information. It has been a great 2016 here at Club de Soleil, and we wish you all a happy and healthy New Year. We hope to see you in 2017!